Injury, typically to the posterior part of both vocal cords, caused by an endotracheal tube1. An endotracheal tube may be used briefly during general anesthesia for surgery, but may be in place for much longer in persons suffering respiratory failure or neurological injury. When severe, the hallmark vocal phenomenology of intubation injury is breathy-pressed phonation. Maximum abduction (separation of the vocal cords for breathing) in a man with a posterior commissure injury due to several days of endotracheal intubation. During voicing. 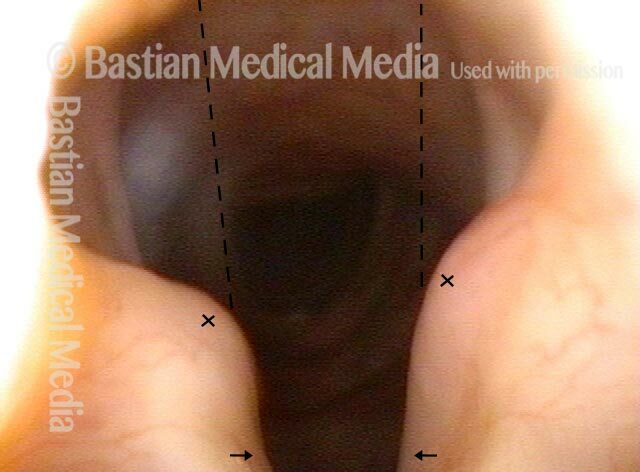 The posterior vocal cords come only slightly closer together (leaving a dark V-shaped gap here); the membranous cords (lower part of the photo) appear to come close enough together that the expiratory air stream brings them into oscillation, seen as a blur under standard light. During voicing, closed phase of vibration, under strobe light. The anterior cords touch, but there remains a very large posterior commissure opening: the vocal processes (at *) do not touch each other as they should during voicing. This is not so much from pressure necrosis as it is from cricoarytenoid joint injury. Open phase of vibration. The vocal processes (again, at *) remain in the same orientation to each other as in photo 3. Abducted breathing position. Note the divots at the posterior commissure (arrows), likely due to pressure necrosis caused by intubation of long duration. Dotted lines indicate the lines of the normal cord, to make it easier to see the divots. The irregular white line along the length of the vocal cords (arrows) suggests that there may have been pressure necrosis of the musculo-membranous portion of the vocal cord and that now the mucosa adheres directly to muscle, with no intervening vocal ligament layer. Maximum phonatory closure. Note that the posterior commissure defect is hidden by the partial closure of the arytenoid cartilages. Even so, the arytenoid cartilages are unable to come into contact. The musculomembranous cords are quite far apart, due partly to tissue loss. Furthermore, the cords are stiff and inflexible. No glottic voice is possible. Abducted, breathing position, standard light. 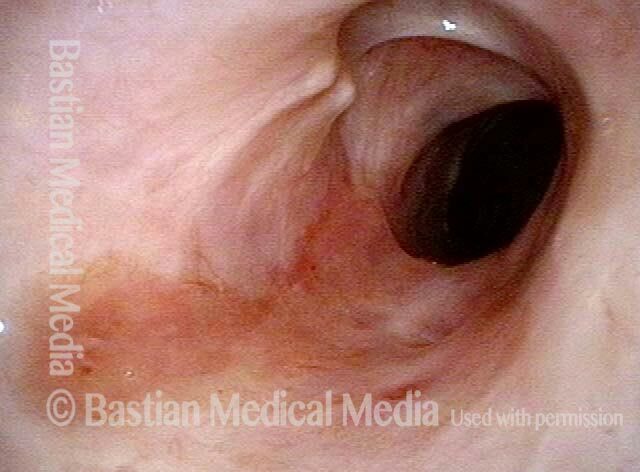 Note the large defects in the posterior vocal cord, presumably caused by a long-term endotracheal tube (breathing tube), used when the patient had a life-threatening illness that required ventilation for many weeks. When the patient tries to produce voice, the vocal cords remain far apart due to injury of the crico-arytenoid joints. The posterior divots add to the leakage of air. Panoramic view shows that the vocal cords abduct (open) fairly fully. At this distance, only a hint of the intubation injury is seen: on one side, at the arrow. Same patient at much closer range, as he is about to make voice. Now the significant posterior commissure divots are seen clearly on both sides. If this were the closest he could get the vocal cords, this would indicate injury to the joints as well. As he actually makes voice, however, the vocal cords do come completely together, proving that the joints can move to fully adducted (closed) position. This young man was intubated for months at birth. For all of his life of more than 20 years, voice has been what he describes as “50%” of normal. Then after a recent URI, it descended to “20%.” In this “breathing” position, one would say that abduction is normal, and evidence of intubation erosions is seen within dotted lines. As he exhales forcefully, it appears that TA and LCA are normal on the left (right of photo). LCA cannot yet be evaluated on the right (left of photo). The medial dotted line indicates the free margin on each side, and the lateral one, the beginning of the ventricle. The posterior commissure divots are still seen (additional dotted lines). 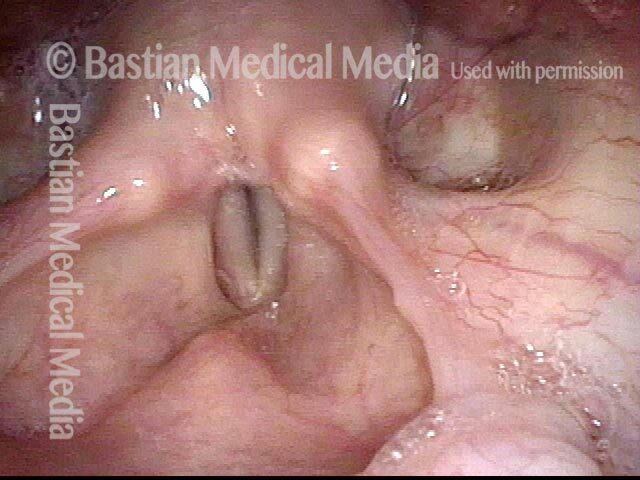 As phonation begins, the flaccid right vocal cord (left of photo) buckles laterally. Posterior commissure visualization will add more information. The right vocal process (left arrow) turns laterally, suggesting that LCA is not working (along with previously-noted TA in photos 2 and 3). Left vocal process (right of photo) turns medially but the rest of the arytenoid more posteriorly appears to be eroded away as also seen in photos 1 and 2. View of the vocal cords, in abducted position, in a patient with voice change after long-term intubation due to brain injury. 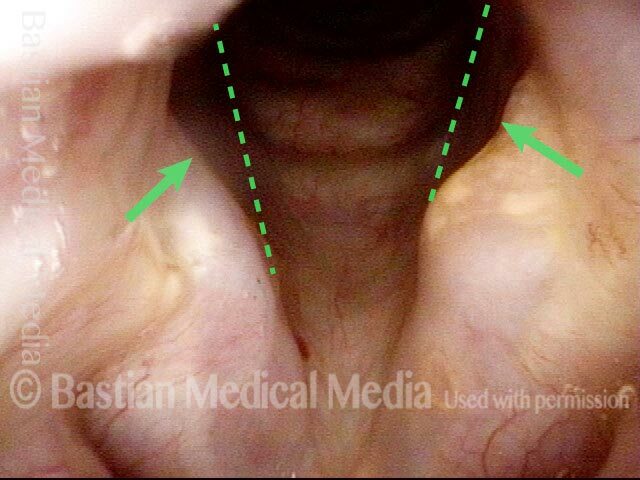 Injury of the left posterior vocal cord (right of image) can be seen, where pressure from the breathing tube caused an erosion or divot (arrow). The synechia is not yet visible from this viewing perspective. Same patient, just below the level of the cords. 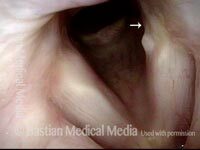 This synechia, located posteriorly, is additional evidence of breathing tube injury. During phonation, the vocal cords appear to come together reasonably well, but as already mentioned, the voice sounds breathy. A close-up view shows a posterior divot of the right cord (left of image, at arrows). This finding (along with the absence of atrophy, bowing, or flaccidity when viewed later under srobe light) confirms that the problem is right cord fixation due to scarring of the right cricoarytenoid joint, not paralysis. During phonation. The posterior commissure deficit caused by pressure necrosis from the endotracheal tube is shown by the dotted line and arrows. Also seen here is that the vocal processes (at each pair of green dots) are not reaching each other, further validating the joint injury. 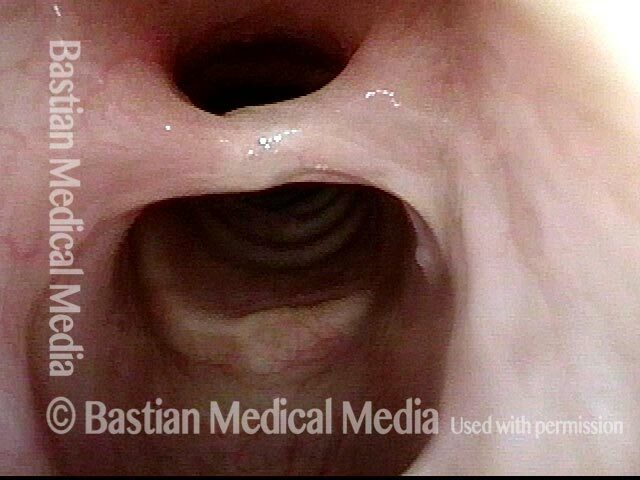 View of larynx of an individual in critical condition who was ventilated for 2 weeks via an endotracheal tube. 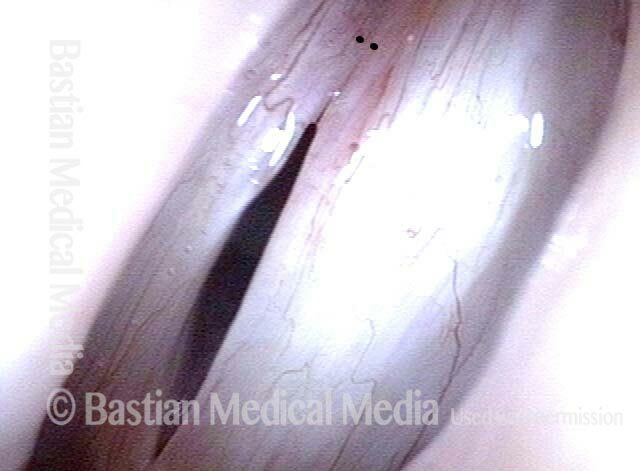 See the erosion of the posterior right cord (left of photo) from pressure necrosis of the endotracheal tube, indicated by the white, semi-circle markings. 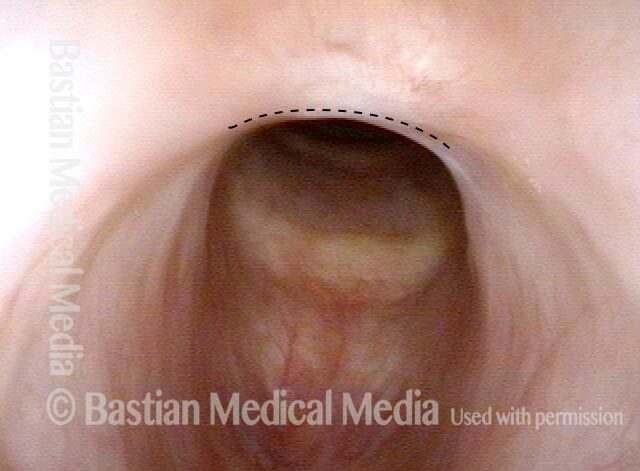 With tip of endoscope positioned deeper within the larynx, between the posterior vocal cords, a small opening is visible several centimeters distally. 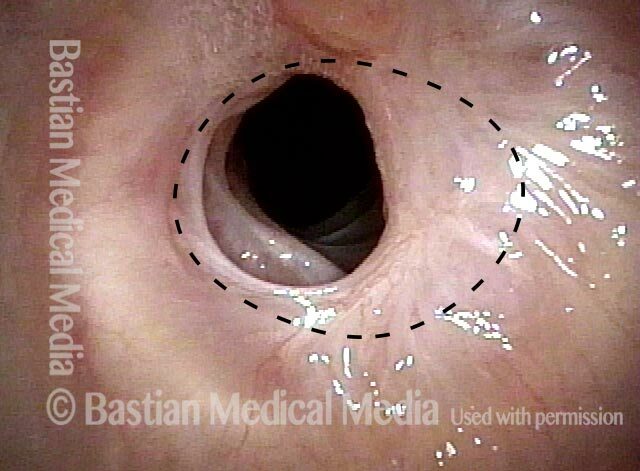 Diameter of the opening is an estimated 20% of normal, which is below the level of the patient's tolerance, and explains why a (white) tracheotomy tube has been placed. 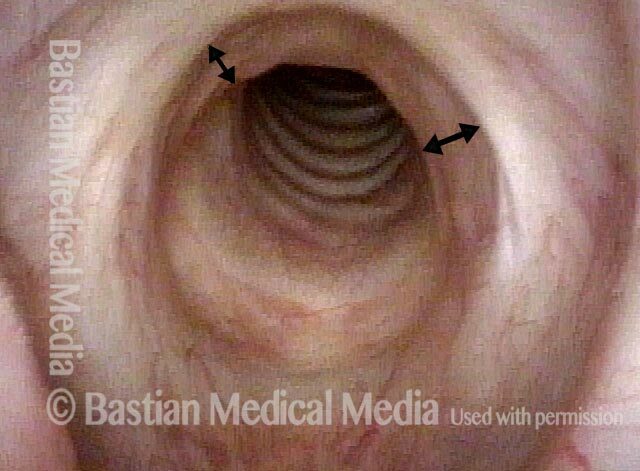 Closer view, showing more clearly the curved upper surface of the tracheotomy tube entering just below the stenosis and serving as a “back door” for breathing. Note in this close-range view that this is a non-inflamed kind of stenosis caused purely by injury. Compare this with stenosis from presumed forme fruste Wegener’s granulomatosis. Gross hoarseness was immediately evident after a surgical procedure involving endotracheal intubation. After a few months, this granuloma is evident. It appears to be pedunculated and attached only where indicated by the dotted line. The small "X" is for reference with photos 2 and 4. 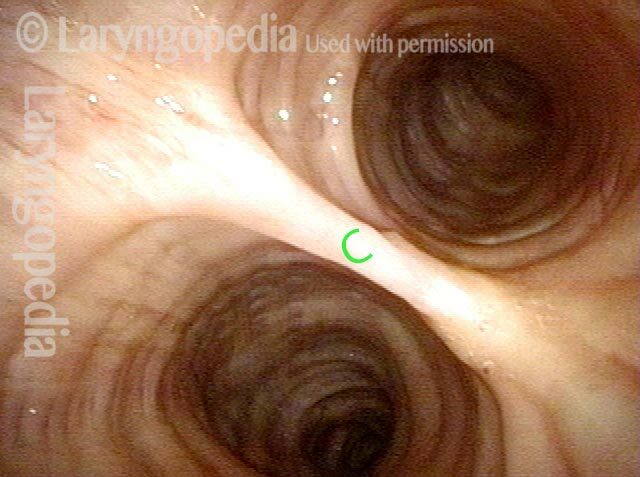 Here, the granuloma is drawn downward into the glottis by the inspiratory airstream. The "X" is for reference with photos 1 and 4. During phonation, seen at closer range, the granuloma rides upward and nearly fills the laryngeal vestibule. Closeup at the anterior commissure. Dotted line indicates anterior edge of the granuloma. The "X" is for reference with photos 1 and 2. A few months later, voice has improved. The granuloma has spontaneously detached. Pinkness remains. During voicing under standard light, note that there is vocal cord blurring on the right cord (left of photo) far more than on the left (blurring is indicated by thin, black lines). This suggests that the left side (right of photo) is not vibrating well. Low in the female range, at A3 (220 Hz), closed phase of vibration. Open phase of vibration at the same pitch, showing that only the right cord (left of photo) vibrates. This young woman has a very weak voice. More than 20 years earlier, she was intubated for a month due to prematurity. Distant view of open (breathing) position. It appears that the right cord (left of photo) does not abduct fully. Phonation, still seen from a distance. The space between the cords can already be appreciated, but without much detail. Dotted line indicates line of partly missing aryepiglottic cord, likely due to pressure from the endotracheal tube. Closer view, breathing position shows a divot in the posterior right cord (left of photo); a similar divot on the left (right of photo) is out of view. Closer view at prephonatory instant shows incomplete closure. Two frames apart, showing phonatory blurring. This patient cannot bring the posterior cords closer together whether phonating, doing a Valsalva maneuver, breath-holding, etc. This indicates joint injury. 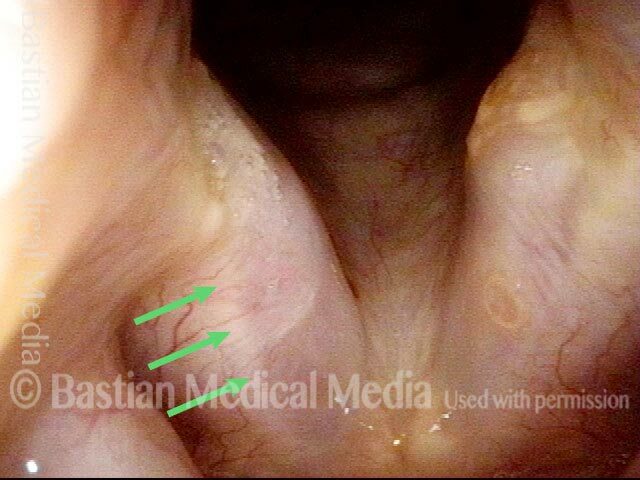 Scarring in the subglottis is greater on the left (right of photo) than the right (left of photo). Almost 40 years earlier, long term intubation for a severe neurological problem. Severe injury is seen at both glottic (vocal cord) and subglottic levels. Dashed lines indicate the outline of the endotracheal tube-induced divots that partly explain weak voice. 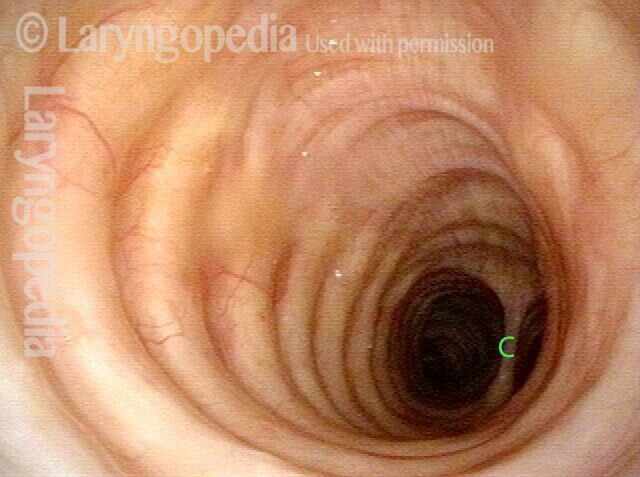 Dotted circle shows what the normal subglottic airway caliber should be. Closer view of subglottic stenosis. As the vocal cords are arriving together for voicing, the posterior commissure keyhole is better appreciated. Dots are for reference with next photo. Still under strobe light, now the flaccidity of right cord (left of photo) is indicated by its larger amplitude of vibration and bowed/ buckled margin. Three months after a 6-day intubation, this man has noisy breathing and a weak, breathy voice. Note the posterior commissure divots from endotracheal tube pressure necrosis, and narrowed subglottic airway likely from balloon pressure. Closed phase of vibration under strobe light shows persistent posterior gap causing air-wasting (breathy) voice quality. Close-up view of the subglottic stenosis, with dotted lines showing what might be normal size. With a membranous component, it is always worth a single dilation to see whether a larger lumen might be gained. In similar cases, an increase of just 10 or 15% lumenal size is much noticed and appreciated by the patient. A few days after balloon dilation of the stenosis, with bruising and inflammation still evident. Closeup of the just-dilated stenosis. Only the membranous (mucosal) band element seen here to have been stretched open will be subject to widening. Final result, seen from a distance, a few months later. Visually, this is not a dramatic change, but when the patient and family were given options “subtle, mild, moderate, or large” to describe the improvement, they both chose “moderate.” And the patient thought the improvement was sufficient for his needs. Compare with photo 1 and 5. Closeup of final, healed view, showing a change of shape of the lumen. This man is content with his current “limited but acceptable” airway. If he became dissatisfied and therefore motivated, tracheal resection and reanastomosis would be his best option, though it would not be wrong to do one more dilation, to see if another slight improvement could be gained. After a 9-day intubation for serious illness, the patient has difficulty breathing due to this “proud flesh” response to injury within the cricoid ring, posteriorly. Breathing has improved in the past week, leading to a decision to await further maturation, rather than proceeding to microlaryngoscopic removal. Close-up view of the lobules of granulation tissue. Air can easily pass around the obstruction as indicated by the arrows. As predicted, breathing continued to improve to the point of seeming normal to the patient, and 2 months later, the granulation tissue has matured and detached, leaving behind a subglottic scar band (parallel lines). Here is a close-up of the scar band. A solid line denotes the anterior border of the scar band for reference in all 4 photos, but compare especially to photo 2. 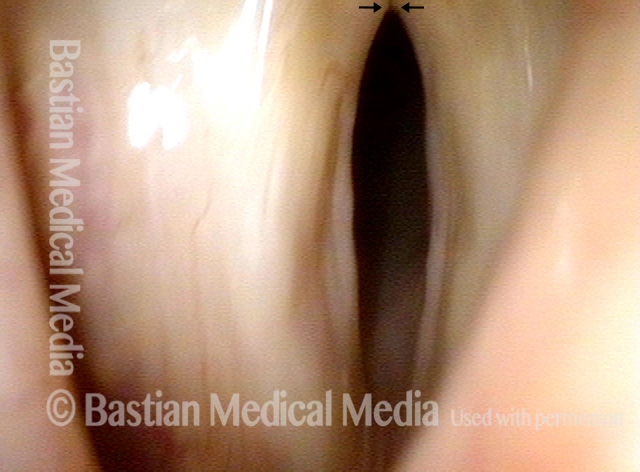 As the vocal cords begin to close, this view (deep into the posterior commissure) shows clearly the divots caused by pressure necrosis outline where the breathing tube sat. 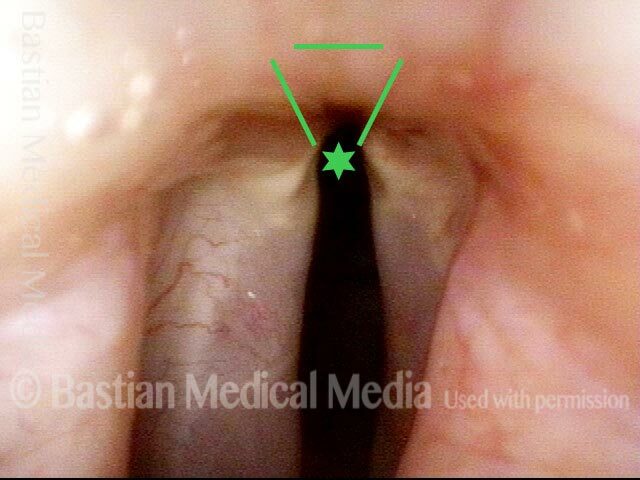 Dotted lines show what would be the normal line of posterior vocal cords. Now in closed voice-making position, posterior defect is out of view, but the vocal processes remain visible and come into contact at arrows. This shows that the endotracheal tube injuries are divots only without scarring of the joint capsules (that if present would prohibit contact of the vocal processes at arrows). There is air wasting through the posterior keyhole not visible here, and the bilateral glottic furrows and pseudo-bowing are extremely evident. They cause additional air-wasting, and adherence of mucosa at the depth of the furrows interferes with the mucosa’s vibratory ability. Extremely poor voice in elderly man after severe, life-threatening illness with complications; including an 18-day endotracheal intubation for purposes of ventilation. Now he is being evaluated for his very poor voice. Here, open (breathing) position at a distance does not show the findings as clearly as in subsequent photos. Small X's are for reference with remaining photos. The arrows denote tip of vocal processes. At closer range, divots begin to be appreciated (above the X's) and bilateral glottic furrows are more clearly noted. Prior to this first visit, this person suffered extensive burns, was intubated for 10 days, and then underwent tracheotomy, and then was decannulated (tracheotomy removed). She has scarring of the posterior commissure outlined by the dotted line. 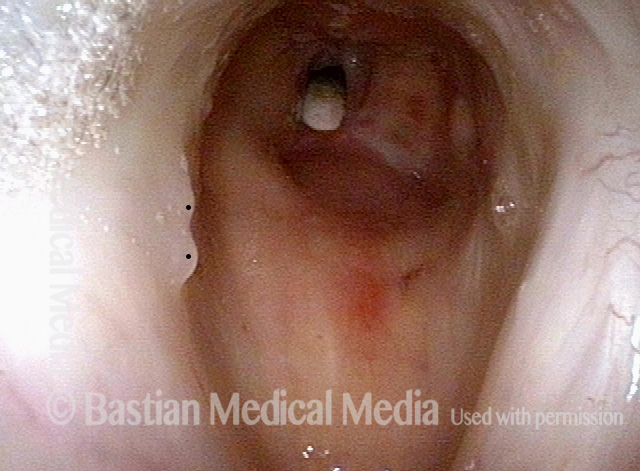 The granulation extends well down into the subglottis. She is uncomfortable with a marginal airway and noisy breathing. Laser and microdebrider are planned to try to avoid having to reinsert the tracheotomy. Tip of the iceberg view of granulation and scarred area. After a series of microlaryngoscopies purely to improve airway and avoid tracheotomy, the granulation has finally matured. Airway is no longer marginal, but is still very limited for significant activity. At close range, the area of posterior scarring is again indicated by dotted line; the dark area of the actual airway is narrow and slit-like. A month after posterior commissuroplasty, breathing is improved due to the widened space posteriorly. Compare the dark area for breathing with photo 3. Six months after posterior commissuroplasty, breathing remains much improved. Compare dark airway contour again with photo 3 above. A closer view of the airway, which is much wider posteriorly than preoperatively (photo 4). When patient makes voice, there is a persistent space posteriorly, where the airway was surgically widened, but again, this has not significantly affected the voice. An octogenarian is being evaluated for recent coughing of months duration. To evaluate her complaint of major mucus production, an “exam of opportunity” mini-bronchoscopy was done. Salivary pooling (see bubbles) is seen, likely due to interference with swallowing caused by topical anesthesia. Just barely through the vocal cords, two circumferential scars are seen at 1 and 2. This prompted a conversation during which the patient noted that decades earlier, she had been intubated for 11 days during a grave illness. At closer range, the zone of stenosis is seen better. This is an incidental finding at this time, and is not responsible for her sensory neuropathic cough. She has no shortness of breath or sense of exercise limitation. 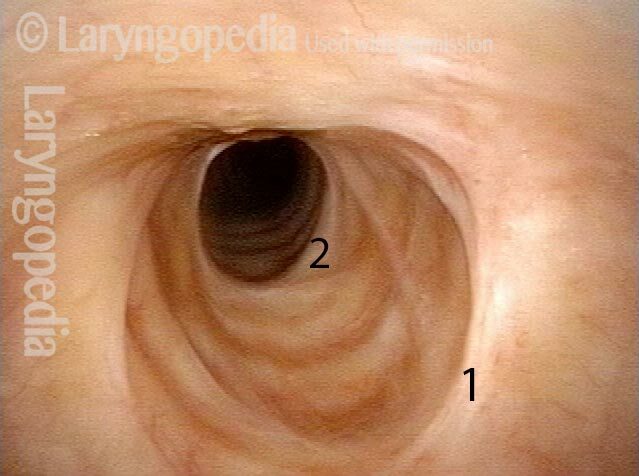 The trachea beyond the lower edge of the scarred segment is of normal caliber but turns to the patient’s left, giving the illusion of distal narrowing. Just below the stenosis, the normalcy of the distal trachea is better seen. The carina is at C.
Right at the carina, and looking into both mainstem bronchi. Many persons who have been intubated for a long period of time likely have asymptomatic and therefore undetected and inconsequential scars like those seen in photos 2, 3, and 4. Born at 25 weeks weighing 1 pound and 5 ounces, this man had been intubated for 30 days in a neonatal ICU. He survived, has thrived, and has a functional but breathy-pressed voice. This distant view begins to show why. 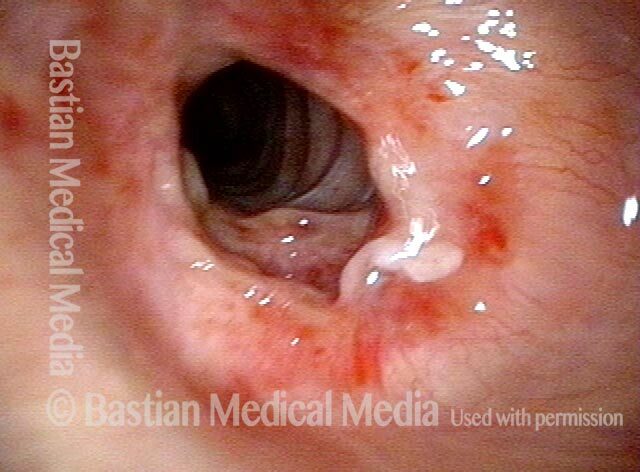 Focus on the damaged left vocal cord (right of photo) for the rest of this series. 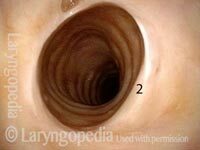 At closer range, the right vocal cord (left of photo) appears normal; the left (right of photo) appears to have much less bulk. Under strobe light, open phase of vibration, note the typical post-injury vascular pattern at the arrow. The vascular pattern of the right cord (left of photo) is normal. 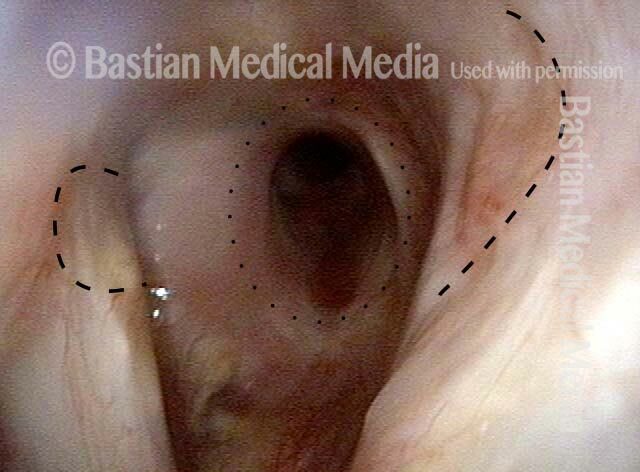 Closed phase of vibration isn't fully closed; the left cord (right of photo) is a at a lower level, and doesn't oscillate due to its scarred mucosa, and a divot possibly from long-ago endotracheal tube pressure, is seen more clearly at dotted line. This young woman was in an auto accident with traumatic brain injury 6 months earlier. Immediately after the injury, an endotracheal tube was used for several days. Now, months later, voice remains quiet, and post-intubation laryngeal injury or neurological deficit is suspected. 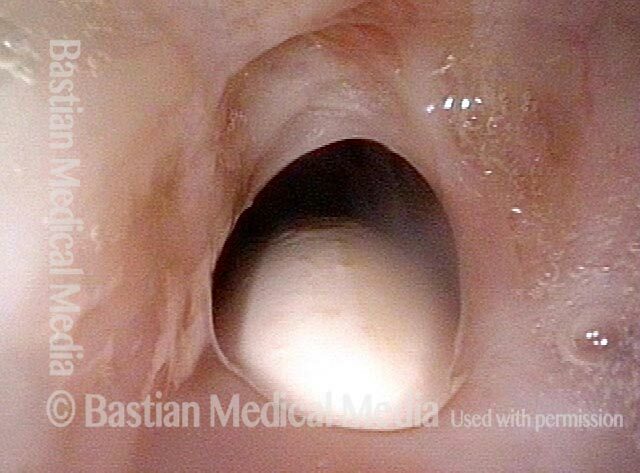 Here, the right vocal cord (left of photo) appears atrophied (spaghetti-lunguini larynx). When the patient is coached to yell, her voice can be surprisingly loud. Posterior closure is good (at arrows) and there are no “divots” such as those seen when the endotracheal tube has created pressure necrosis. But why isn’t the voice weak, given the apparent right cord atrophy? The strobe images that follow explain. Under strobe light, during the closed phase of vibration, vocal cord closure appears to be firm and equal bilaterally. Correlating with the patient’s ability to produce loud voice, the open phase of vibration reveals equal amplitude and mucosal wave. While the right cord appeared atrophied, it shows no flaccidity. Her soft voice is a central “executive” problem; the primary explanation of the weak voice is the loss of the vitality and energy commanding the end organ. Nothing needs to be done to the larynx here; instead, the patient is taught a strategy for revving the “inner engine” of voice. This entry was posted in Multimedia Encyclopedia and tagged Audio, Disorders, Miscellaneous voice disorders, Photos, Voice & other larynx disorders by admin. Bookmark the permalink.